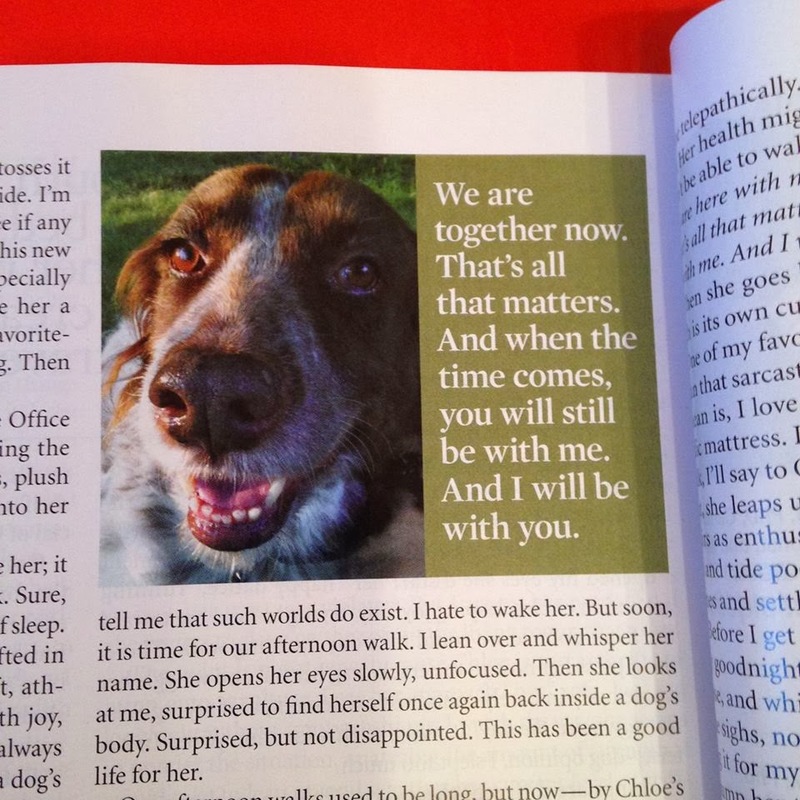 My last installment of "The Chloe Chronicles" from the December 2013 print edition of Bark magazine is now up on the Bark's website. I handed in this installment about three weeks before Chloe died. In this piece, I wrote about how Chloe was slowing down and showing signs of aging. I wrote about how I was starting to worry that some day she might get sick and die. I had no idea she was actually quite sick, yet as I re-read the piece, the signs are there. I don't know how to react upon re-reading this. I could feel ashamed and horrified that I treated her "signs of aging" so lightly; or I could feel awed that, at some level, we got to say goodbye in such a such a deep way. What awes me most is the pull-quote Bark chose to use. A few months ago, when I expressed my concerns about to Chloe that I wouldn't be able to handle it if she got sick, she replied (telepathically, of course): "Don't worry. We are together now. That's all that matters. And when the time comes, you will still be with me and I will be with you." Here's a link to the column. Enjoy! By now, most of us are familiar with the term "Seasonal Affective Disorder," as well as it causes (chemical imbalances caused by changes of season, temperature and/or amount of sunlight available) and effects (depression, lethargy, inertia, etc). I was afflicted by this disorder for years--especially during those long dark winters in the Northeast. And at first I tried approaching this SAD from both traditional, Western, and alternative routes: Vitamin D, light box therapy, St. John's wort. I even, for a time, tried taking medication--which helped, I suppose, but made me feel dull-witted and not quite real. Finally--in a more drastic measure--I decided to just move to Florida for the winters. The Florida sunshine helped, believe me; but after five seasons of SAD I finally decided to approach the disorder from a more organic standpoint: Kundalini Yoga. One of the most challenging aspects of SAD, for me, was the complete lack of motivation I experienced on a daily--sometimes hourly--basis during the winter months. Especially first thing in the morning. The cause of this lack of motivation is neurochemical: decreased levels of noreperephrine and serotonin caused by decreased exposure to sunlight. But the effects can be devastating--especially to us work-obsessed Americans who thrive on being productive. (I like to use the word "creative".) Sufferers of SAD who find themselves too depressed to create can become even more depressed out of frustration. And round and round it goes. But the good news is that there are many, many simple practices from the Kundalini Yoga tradition and beyond that can help those who are prone to SAD break this cycle of seasonal depressions. While many of us don't start to feel the full effects of Seasonal Affective Disorder until December or January, many physicians--both Eastern and Western--now believe that the best time to start addressing the disorder is in the fall, when Daylight Savings goes into effect. (My doctor actually advised me to start my pranayamas and kriyas in mid-summer, after the summer equinox.) The reason is fairly obvious: as the days shorten, and we lose two precious minutes of sunlight per day, our serotonin and dopamine levels are slowly but surely being affected by these changes. Our energy wanes, our moods slowly darken, and our minds cloud. Then, all of a sudden, in the throes of cold, cold January, you wake up and find that you can't, well, wake up. But by addressing any potential neurochemical imbalances now, we can stave off these crippling winter depressions. The thought of doing 52 minutes of daily practice--or even three minutes--can be vastly intimidating to the SAD-afflicted mind. I remember once bemoaning to a friend: "I don't have the energy to do all the practices that I absolutely know will give me energy." But then I remembered three very important, life-changing quotes. Arthur Ashe's "Start where you are." And Yogi Bhajan's "If your sadhana is more important than your neurosis, you are fine. If your neurosis is more important than your sadhana, you are not." This statement really woke me up. Yogi Bhajan has called Sat Kriya one of the most powerful and complete kriyas in Kundalini Yoga, adding that "If you want to change the world, do Sat Kriya." There's a reason Sat Kriya is also known as "The Everything Kriya." Its benefits are innumerable, and sufferers of SAD will enjoy its energizing, mind-clearing, Kundalini-raising effects. You might find that practicing Sat Kriya for just three minutes a day will shift both your mind and body from that frozen state of "I can't do anything because it's too cold and dark" into a more expansive state place of fortitude and action. Kirtan Kriya is another extremely powerful (and simple) kriya that can help shift the SAD-plagued mind. Yogi Bhajan has said that if you had time to do only one meditation per day, Kirtan Kriya should be the one. Among its other benefits, this kriya eliminates brain fog, breaks up negative habits and patterns, and balances the hemispheres of the brain--thus restoring emotional balance. Yogi Bhajan has said that of all the twenty types of yoga, including Kundalini Yoga, this is the highest kriya. "This meditation will...cut through all barriers of the neurotic or psychotic inside nature...This kriya will give you the necessary vitality and intuition to combat the negative effects of the unchanneled subconscious mind.”Simply put, this meditation "cuts through all darkness" which is basically what a person in the throes of SAD needs most. For three times the benefit, trying practicing the"Triple Kriya" meditation, which consists of Sat Kriya, Kirtan Kriya and Sodarshan Chakra kriyas, in that order, for 11 minutes each. You will be your own internal sunshine for the rest of the day (and for lifetimes to come). The Long Ek Ong Kaur, also known as Morning Call, Long Chant, and the Adi Shakti Mantra, is one of my all-time favorite mantras. According to Yogi Bhajan, chanting this mantra will open up all the chakras, charge your solar centers, purify your karma, and align your soul to the Universal Soul. In SAD terms, this mantra is perfect for those dark cold mornings when you're so depressed you can't get out of bed. In fact, I used to chant this one while in bed (pushing myself up into the proper posture first, of course). This mantra literally gave me the energy, strength and will to rise. In my humble opinion, it's better than caffeine. Also known as "Mantra to Illuminate the Dark Night of the Soul," the name speaks for itself. This mantra helps transform those SAD feelings of yearning and hopelessness into feelings of deep faith and hope. There are many extraordinary recordings of this mantra to choose from. Singh Kaur's version is particularly stunning: as sweet and gentle and rejuvenating as morning sunlight. Another quick fix for those who are too depressed to even think about doing their practice, a great place to "start where you are" is breathing through the right nostril. This simple yet profound practice stimulates the Pingala channel, also known as the male channel or the solar channel. Just a few minutes of right-nostril breathing can help stimulate one's own internal solar energy, thus counteracting the lethargy and mental fogginess some of us feel on those cold winter mornings and/or when the afternoon sun begins to set. At this point, most of us SAD sufferers know about the importance of absorbing sunlight and of taking Vitamin D. In yogic traditions, practitioners are advised to expose their hair, head and skull to the sun at least once per week. Yogi Bhajan always stressed that exposing the forehead to sunlight is especially beneficial. This is because the forehead bone is porous, which means that more light can pass through and stimulate the pituitary gland. And a well-stimulated pituitary gland, as we know, results in healthy levels of dopamine, serotonin and melatonin. But who wants to expose themselves to full sunlight in the winter, right? Especially those of us who live in colder climates? When I lived in the Hudson Valley I would do my morning practice in front of a sunny window, positioning myself so that that first ray of morning light beamed straight onto my forehead. To take it a step further, try transforming your daily dosage of sunlight into a devotional practice. I've always loved the concepts of those mythological sun gods of Egypt and Ancient Greece; so whenever I am in the sun I like to offer thanks to Ra and Apollo for sharing their healing light with this planet. I ask them and my other guides to help my body to integrate this blessed sunlight as efficiently as possible, so that I might be of utmost service to humanity on that day. I swear it makes a difference. (They don't use the term "Sun Worshiper" for nothing.) If you think about it, the word "RA" in itself is a powerful mantra. In the Kundalini Yoga tradition it means "sun." Among American sports fanatics, it means "Yahoo!" So you can't go wrong. Flower essences are distilled tinctures that basically carry the vibration of flowers, meaning that when you take a few drops of, say, Summer Snowflake essence, you are taking in the frequency and qualities of Summer Snowflake. This delicate flower is winter hardy but also thrives in extreme heat. There are hundreds if not thousands of essences to choose from, which can seem a bit overwhelming at first. So my advice is to call the essence makers directly--these kind and caring people will usually offer intuitive suggestions based on your personal needs and constitution. Most aromatherapists agree that citrus oils are the best choices for Seasonal Affective Disorder It makes sense if you think about it, given that citrus typically grows in warm, hot, sunny places. Think California in a bottle! Organic essential oils are best, distributed with cold-mist diffusers. Spirit Voyage blogger Donna Shepper wrote a wonderful piece about the use of essential oils to help treat SAD: Read it here. Depression can be uncomfortable and painful. There's no doubt about that. But when approached from a spiritual standpoint, it can also be beneficial. Yogi Bhajan used to stress that "In all darkness, there is a light and in all light there is a darkness." Author Michael Beckwith also points out that "a dark night of the soul may be considered to be a moment of gestation; a new inner realization that is gestating. Just as a seed needs to be in the darkness before it breaks into the light, there are spiritual realizations gestating within us. 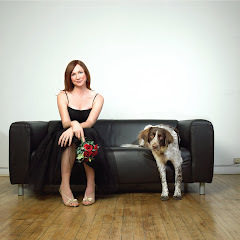 We may be giving birth to something, so it doesn't feel comfortable." I also like to remind myself something I learned long ago: Whenever you feel like giving up, recognize that you have reached a moment of great change. That's your moment of power. Like Yogi Bhajan says: "Keep up, and you will be kept up."